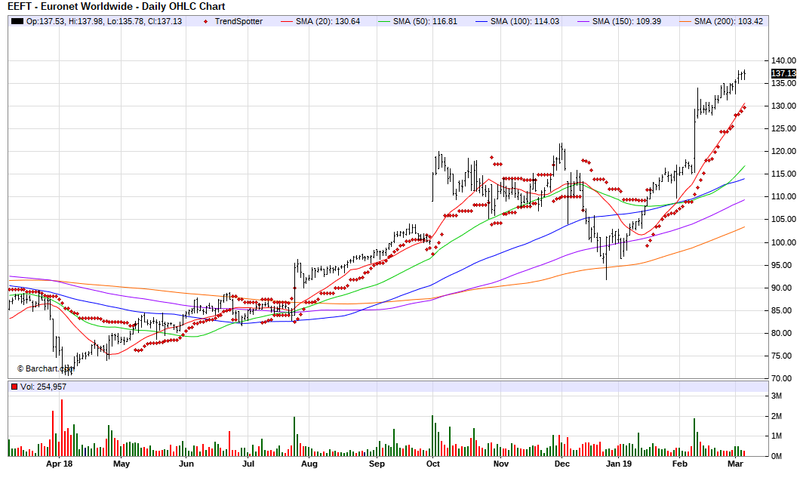 The Barchart Chart of the Day belongs to the financial services company Euronet Worldwide (EEFT). I found the stock by sorting Barchart's New All Time High list first by the highest Weighted Alpha, then used the Flipchart feature to review the charts for consistent price appreciation. Since the Trend Spotter signaled a buy in 1/18 the stock gained 21.35%. Euronet Services Inc. is an industry leader in providing secure electronic financial transaction solutions. The company offers financial payment middleware, financial network gateways, outsourcing and consulting services to financial institutions and mobile operators.